Over the last two weeks I set out to read every article written about errors, misinformation, verification and accuracy in the wake of the Boston bombing media coverage. What follows are a few thoughts and almost 40 links, organized thematically, to some of the best articles on these themes. This is the first of a few posts as I analyze and extract key take-aways and concrete lessons from the collection of articles. As a starting point, for those who want to study media coverage of the Boston bombing as a case study of breaking news verification and errors, below is a round-up of some of the best articles. There are (many) others, and some good ones I have no doubt missed (add them to the comments section). I don’t agree with all of these viewpoints, but together they present a well-rounded debate about these issues. These are the journalistic equivalent of autopsy reports. One of the most common kinds of article I found in my research, the “what went wrong” posts try to get a handle on, and often try to place blame, for the misinformation that spread during Boston reporting. At their best, these posts actually help clarify mistakes that were made, so we can learn from them. These posts don’t offer the kind of concrete advice or training the earlier “how-to” articles do, but they do contribute helpfully to the debate about how we should address misinformation and verification. They represent an interesting set of ideas and considerations for new ways news organizations and citizen journalists can approach breaking news. Can Social Media Help Us Create A More Informed Public? So many media failures this past week were driven by the ‘scoop’ mentality, a dangerous relic of the past. […] The greatest threat to ‘True Journalism’ is not social media but an outmoded concept of breaking news. The anonymous Twitter user rushing to name a suspect or the TV reporter breathlessly quoting unnamed sources are cut from the same cloth. This is ‘Me First’ journalism, powered by vanity and self-importance, and it is the greatest threat to ‘True Journalism’. These articles provide a broad overview and explore overarching themes from the Boston bombing coverage. These meta-pieces tend to take a step back and look at the bigger themes at play. Many include useful comparisons between coverage of Sandy Hook and Boston. Highs and lows in a week’s worth of breaking (broken?) 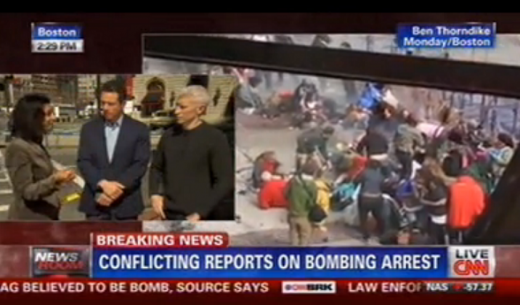 new coverage of the Boston Marathon attack. Boston: just another day in the news revolution?